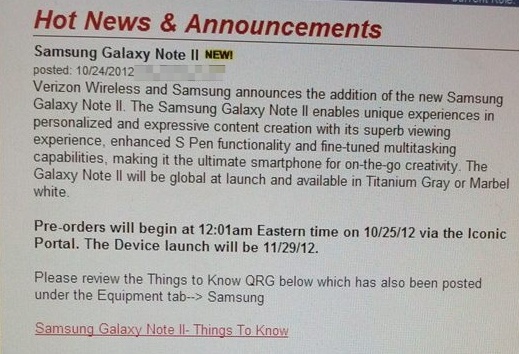 Big Red announced pre-orders this morning for the Samsung Galaxy Note 2, yet would only go as far as “coming weeks” for a launch date or for when customers could expect to see those pre-orders. When you checked out during the pre-order process, an expected shipping date of November 27 was mentioned, so the screenshot above which pegs November 29 as the official launch certainly makes sense. We should also point out that a number of well-placed readers have mentioned November 29 as the launch date for the Note 2 on Verizon in the comments of a variety of our posts, but we wanted to share this to help back up those claims. Assuming nothing bad happens over the next few weeks, I’d say the 29th of November is the big day. Can you patiently wait a month?